Crop circles - timelapse, underground items, no E.T.. Explanation, decipher, decode, discovery, break code, explaining, decryption, puzzle out, scientific research. No one E.T. 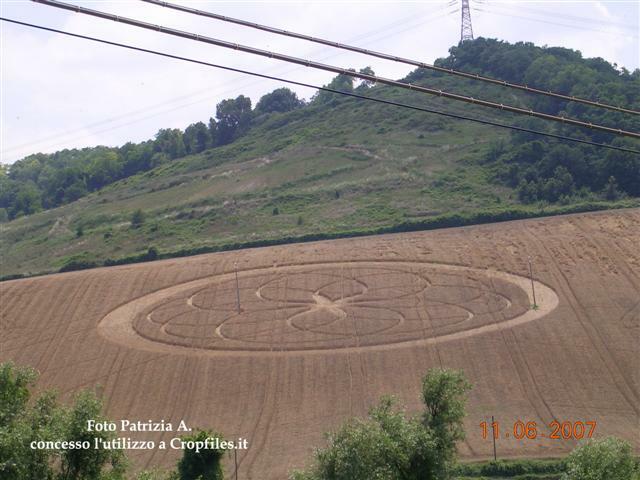 (extraterrestrial) had made even a sole crop circle in the whole world. Don't be afraid of them. E.T., also named extraterrestrials (aliens, space aliens). 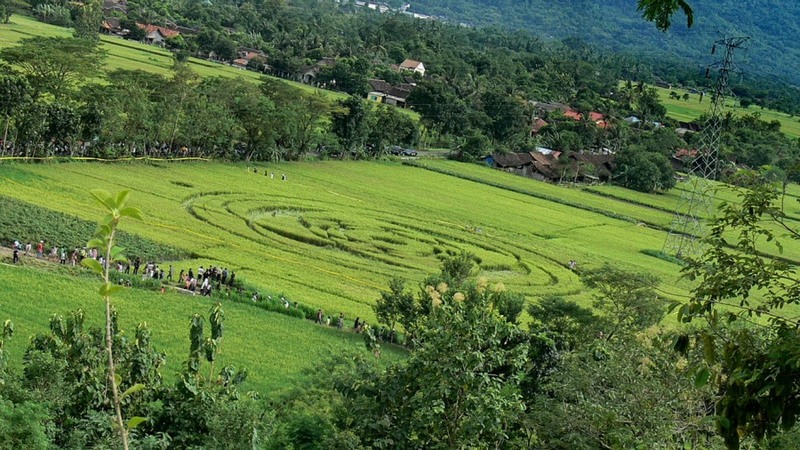 Everyone is afraid of them, no one has ever seen them, but everyone thinks that they are making Crop Circles. Explorers, who are dedicated (by theirselves) to Crop Circles research, even afraid to use the timelapse cameras to a greater extent. More than one time happened some shame, but at this point it will not be analyzed here. Deployment of timelapse cameras Crop Circles researchers probably do not realize in greater extent mainly because that they are afraid to learn something they really do not want to know. Perhaps they are afraid of that caught aliens could retaliate, whether on themselves, or to humanity (what a sensitivity). They are afraid deploy timelapse cameras to a greater extent in places, where could arise some patterns in the future, they fear of that they would really nick aliens in the act, and they would have avenge them once forever. Better once forever end of courtesy with aliens, the explanation follows. Dear mystery hunters, UFO observers, alien hunters and believers! There is absolutely no need to worry about anything from aliens, no one will make any revenge nor commit any damage, if anytone of you even slightly contribute to the clarification of any described mystery. Aliens are really totally undetectable by timelapse cameras, because they do not were near or far from any Crop Circle ever. There is no need to be afraid of any alien, that the vast majority of Crop Circles researchers still consider as the real authors of figures. Properly set timelapse camera may capture the real authors, that in fact "paint patterns in the fields", not using a paintbrush, but electron beams much more stronger than a locomotive. To draw all so incomprehensible shapes they use two really very simple explainable and easy understandable physical phenomena, like resonance and interference. Timelapse cameras is not necessary to use only for mass survey of Crop Circles, is possible use them to clear up the principles and process of damaging and lodging (damaging, weakening) crop and any other arable plants anywhere in the world. A pair of cameras in a small distance from each other can be used to capture and determine the lightning location impact with an accuracy of centimeters. Simply use the principles of geometry, optics, mathematics and photogrammetry. 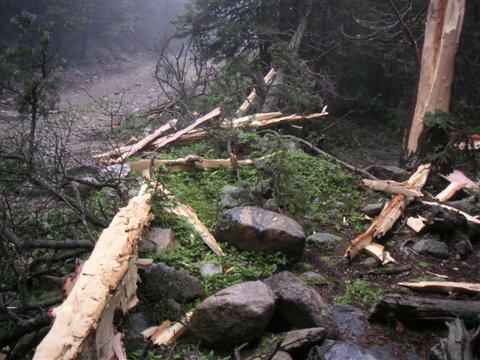 On the pictures (links follow resources) possible to see examples, what is able the lightning discharge perform with several-tons tree (rough estimate of about 5 tons). Tens to hundreds kilograms heavy chunks are cloven in a split second and scattered along on the ground like toothpicks. Therefore, it is a wonder how it is possible that in a place where struck the lightning discharge right into the field, there is possible to find nothing else, than a "pinhole", and sometimes not even that. It would rather be expected there a big crater. It is caused by that in most cases, immediately after touching the ground (wet), the vast majority of the remaining energy shocks uniformly distributed preferably by tha shortest paths with the lowest resistance just below ground. Sometimes is there the amount of charge (energy) really over-supplied, and in addition the difference in conductivity of the plasma channel and the ground is enormous. The lightning channel in the air has a resistance of less than 1ohm per meter, width not exceeding 1 cm, soil hundreds to thousands of ohms per meter, but relative to the cube with edge of 1 m.
Some dangerous phenomena may appear there, because at small distances from the lightning discharge will be safe never. The excess charge sometimes may not be diverted immediately below the ground, and may take some travel, mostly in the tractor tracks, but also between them like on a slide or a roller coaster. In some cases, it may discharge after touching the ground lead to the phenomenon, which could be best likened the phenomenon electrical common practice - "dielectric breakdown". In this case, may continue to discharge very quickly relatively deep underground. It is likely that in this case they can in the immediate vicinity lightning channel underground create fulgurites. (photo Lightning: PAE) Severe conduction of the discharge under the the ground is in the case of formation of some patterns, mostly circles, more than highly probable. 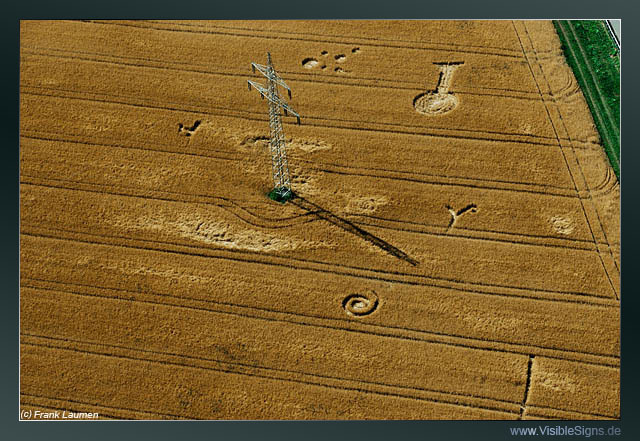 In some places, where there appeared some Crop Circles, there is really no need of a long search nearby high-voltage and LV towers. On the other tens of percent photographs, although no potential lightning rods or HV towers are not observable, but after a short visit of Google Maps or Google Earth is possible to find them there. Author of these lines knows what he's talking about, owns one of the largest collections of various Crop Circles GPS positions found in the past anywhere in the world (hundreds), and very soon will be available a page, where will be gradually published one after another. Conduction of the discharge on the ground surface and the speed of its speed conduction underground and any other conduction in the shallow underground depends largely on it, what and how deep is located underground. Utility lines, archaeological relics, geological faults, springs, abandoned mines, aquifers, or anything like that. In really rare cases, discharge may cause an underground explosion of real equivalent several hundred kilograms of TNT, when during the travel underground meets with unexploded, even if considerably dilapidated and considerably staggered, several hundred kilogram bomb from World War II. (craters in the fields). Something like a small crater in the field may also arise if there becomes in a shallow underground something displayed in photographs of trees, which is probably in some cases possible. 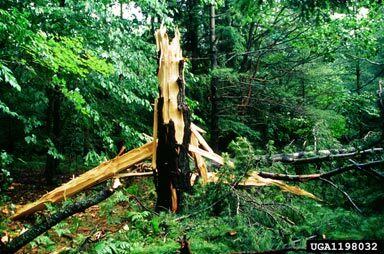 Lightning can strike such not decomposed root system of already nonexistent tree, whose residues can persist underground several years. details on page Lightning conductors in fields. Evidence that may support some claims on this site and many other may farmers bring by their own. Surely they would like also a little contribute to clarify the longstanding mystery, and they are definitely tired of long lurking with guns and hayforks to foreign invaders, who just do not come. It will be quite enough if they will some evidence described here ... unearth. In some places in the underground are likely to find plowed some remains of agricultural activity, maybe even low level under deep ploughing - machine and tools parts (metal), once used for cultivation. Is possible observe them on some pattern photos. With a much lower resistance to the surroundings as well as in the case of pipe, there becomes an increase of currents above that places and thus the higher plant damage. Here are two examples, where such items are located (were located) underground, and similar places will certainly be possible to identify more. 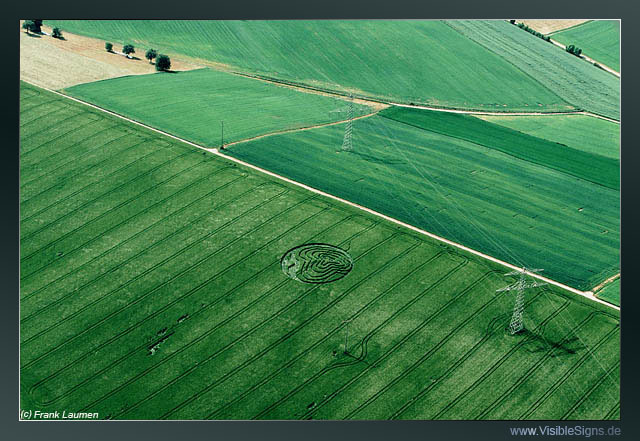 Probably will originate similar "underground markers" in places of some Crop Circles figures anytime in the future. It may not be the only remains of agricultural activity, there may be also included archaeological artifacts or parts of collapsed airplanes. Similar described formations, of course, may be created, and probably really were and will be created without forming any regular pattern in their close proximity. The very last (last but not least? ): why would those unhappy E.T. be painting almost exclusively in corn (although exceptions exist), when during a significant part of the year there is on the entire globe placed significantly better colored and usable (for their alien - rats laser guns or vortex - energy trumperies) and much nicer "canvas" - surface of the snow? The fact that thunderstorms are almost absent in winter (and if yes, the snow surface following them is very often much better "cleaned" than before), would any reader certainly make judgment of himself. Another general fact is fairly widespread phenomenon, that during the winter frosts people rather sit at home on their asses, all warm, rather than saddle their hang gliders and similar machines and tried to watch Earth's surface from above.